Wash the fish, pat dry and place on a large plate or platter suitable for steaming. Mix the sauce ingredients together in a small bowl. BUILD YOUR WOK CLOCK: place the crushed soybeans at 12 o’clock, then arrange the garlic, chilli, sauce bowl and chopped coriander clockwise around the plate. Set a large wok or steaming pan up with a steamer stand and fill with boiling water to a third of the way up the sides. Place the fish plate into the wok or pan, cover with a lid and steam for 7–12 minutes, until cooked (see Tip). Remove and set aside, covering the fish with foil so it stays warm and moist. Drain and dry the wok, add the vegetable oil and heat until smoking. Add the soybeans and stir-fry for 30 seconds, then add the garlic, chillies and sauce. Bring to a vigorous boil, then add half the coriander and continue to cook for 1 minute until the sauce has thickened and reduced by at least a third. 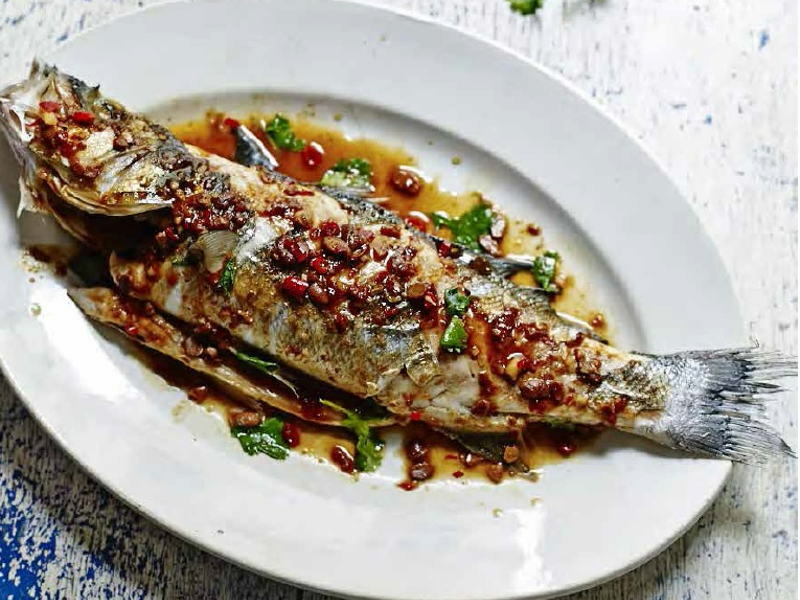 Pour the sauce over the steamed fish and garnish with the remaining coriander to serve.